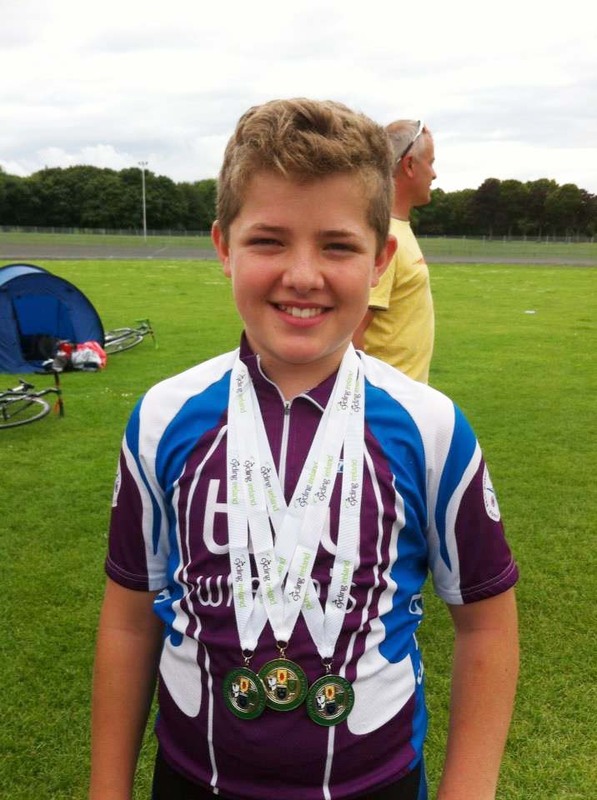 In a round up of all the recent club news the main event was Thomas Pickford taking the Under 12 National Track Sprint title against stiff competition from Northern Ireland. Jason Howick took the title of Club Road race Champion and Mark Murphy won the 2014 inter-club time trial league. Thomas Pickford won the Youth under 12 track sprint championships in Sundrive winning in fine style against tough competition. The final sprint ride off was a lesson in how to ride the perfect sprint with both riders taking off at walking pace with Thomas’ waiting patiently for his opponent to wind up the sprint first. Thomas timed it to perfection coming from behind to take it on the line. Thomas also picked up two silver medals in the timetrail and scratch race. Ben Docherty was unlucky not to medal in the under 14’s time trial missing out in the tt by 2 hundredths of a second. The club road race championships was won by Jason Howick from a sprint finish on the filter beds in Roundwood recently. John Spain took second place and Geoff Robinson took third. In the womens race Sarah Pratt won from Mary Dawson and Jane Martin. 1st Vet was Noel Conway and David Conroy first under 16. The inter-club league concluded recently with Mark Murphy winning from Anto Dunne and Dave Peelo. First un-placed junior was Sam Gilmore, with Mary Dawson first woman. This years inter-club league is in full swing with 2 events already completed. There was a good turnout from all the clubs for the road race in Ashford and the grass track race in Shangannah. The next race in this is the mountain bike in Ballinastoe next Monday the 11th at 7pm. All youth are welcome. On Sunday the main event was the South East Road Club GP held in Inch, County Wexford. Representing Bray were Ian Murphy, Ed O’Brien, Anto Crean. All rode well with Ed getting into an early break that was unfortunately hauled back. Spins are ungoing from Kilmac every weekend and Tuesday night training continues from Kilmac also. Full details are available on the website.